OXFORD, Miss. — The Ole Miss Rebels kicked off the annual Grove Bowl at 3:00 p.m. Saturday in Vaught-Hemingway Stadium. To begin the game, the defensive unit, wearing read in the contest, was given a 27-0 lead over the offense who was clad in blue. The offense needed to score points to make up the 27-point difference. The defense defeated the offense, 29-25. On the last play of the game, safety Kam White picked off a two-point conversion and took it to the house to end the offense’s hopes of tying the game. 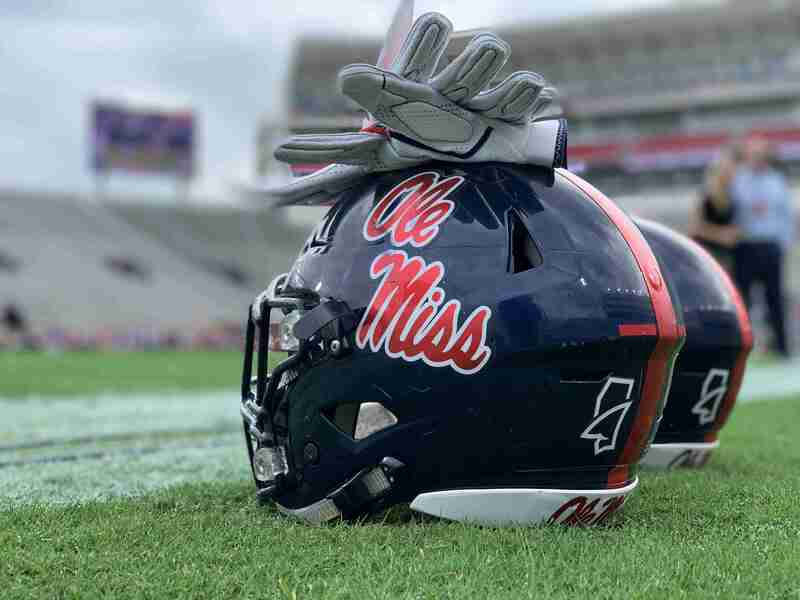 Head coach Matt Luke explained that he and the staff wanted to emphasize player development and improvement, thus they kept the game plan somewhat simple. “Overall it was a good day. I thought that it was a competitive game, Coach Luke said. While there was not much blitzing from defensive coordinator Mike MacIntyre’s new base 3-4 defense Saturday, we saw a faster and better-tackling defense. They looked physical and attacked the football. The offense took every snap from the shotgun, as expected. 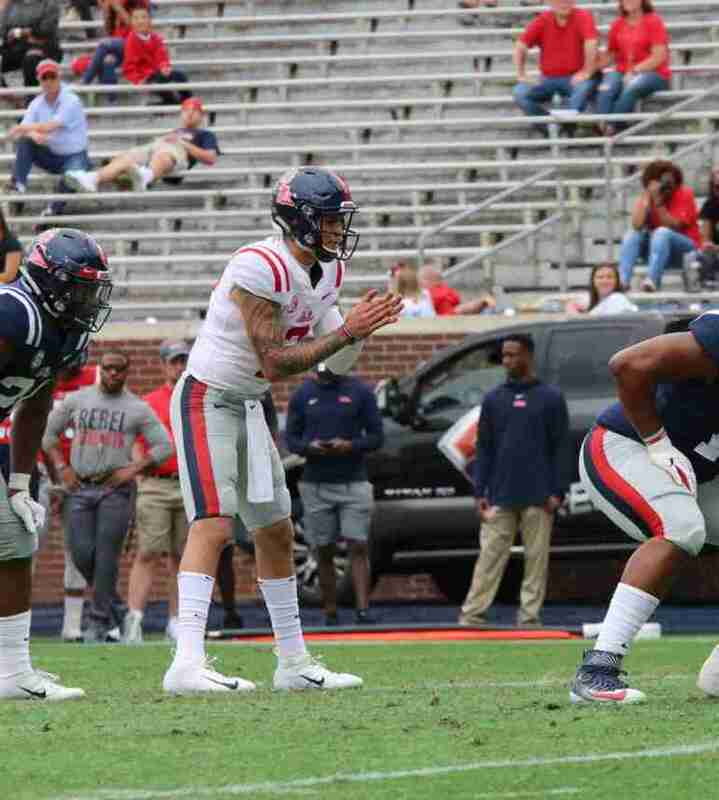 On many passing plays, redshirt freshman quarterback Matt Corral rolled to his right and was accurate with his on-the-run throws. Corral completed 22 of 37 attempts for 240 yards with a 4-yard touchdown to Braylon Sanders and one interception. He also rushed the ball 9 times for 4 yards. Sanders and Corral both wore white in the game denoting no contact. Corral wore this for precautionary reasons, while Sanders is nursing an ankle injury from last season. Next in line for the N.W.O. Sophomore Elijah Moore is absolutely electric and is as dynamic of a playmaker as any of last season’s star “Nasty Wide Outs,” or N.W.O. as the Rebels’ receiving corps is known. After D.K. Metcalf’s season-ending neck injury, Moore stepped up in his freshman campaign and showed he could create mismatches in the slot. Moore’s quickness gives him the upper hand against opposing defenses. In the Grove Bowl, he caught 3 passes for 78 yards, which is good for second most in the game. 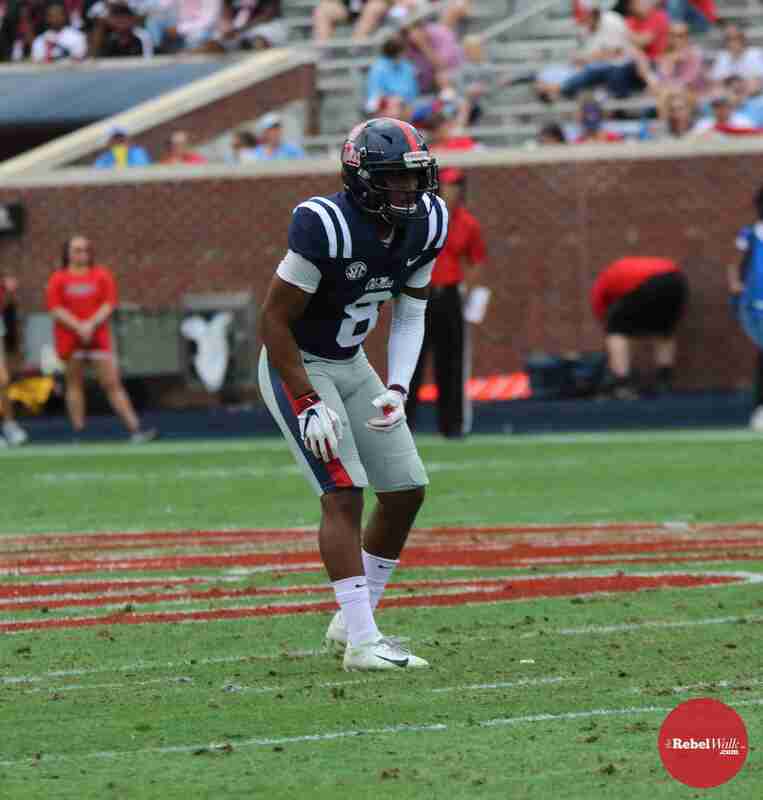 Sophomore Tylan Knight could very well be an “X-factor” for the Rebel offense this year. He finished the day with 5 catches for 91 yards and a touchdown. While Knight, who is listed at 5-foot-6, 173 pounds, could be considered undersized, his quickness is similar to NFL players such as Darren Sproles and Tarik Cohen. Though Knight played some at running back last season, in Saturday’s game he displayed flashes with some nice grabs from the slot. New offensive coordinator Rich Rodriquez could advance Knight’s untapped potential and take it to the next level. On the defensive side of the ball, senior Qaadir Sheppard is going to cause problems for offenses around the SEC. After shifting from defensive end to outside linebacker, Sheppard will be utilized in pass coverage more often. With his 6’3, 250-lb frame, he matches up well with tight ends in coverage. The move to outside linebacker should allow Sheppard to stay fresher in the trenches which will give him more explosion when rushing the passer. He finished the Grove Bowl with 4 tackles and 2 sacks. Freshman quarterback Kinkead Dent impressed with his athleticism. He escaped pressure and used his legs to pick up chunks of yardage. Dent and fellow freshman Grant Tisdale split the snaps with the second team early in the game, but Dent began to receive more playing times as the game progressed. Dent completed 4 of 12 passes for 36 yards and rushed the ball six times for 50 yards. Tisdale completed 3 of 5 passes for 37 yards with a 19-yard touchdown strike to Tylan Knight. When asked to compare the two newcomers, Coach Luke gave Tisdale a slight nod because of his touchdown pass. With Matt Corral entering fall as the likely starter, there is not yet clear-cut backup at the moment. Fall camp will provide a much better indicator, especially with freshman quarterback John Rhys Plumlee coming to campus. 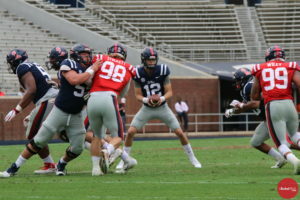 However, the performances of both Dent and Tisdale should give Rebel fans confidence in the options at backup quarterback.